Spring is in the air. We are finally having some warm weather. Houses are being aired and our neighbours are starting on all the weeding and painting that has to be done before Easter. 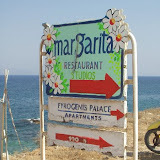 We are anticipating a traditional lamb barbeque on Easter Sunday afternoon at Margaritas, one of our favourite tavernas. Below is a link to Karin’s photo account of an August afternoon there and elsewhere on Paros. Note that this was an August afternoon when the island is supposed to be over crowded. This year we may even go again to the dramatic parastaseis in Marpissa. The print edition of Paros Life has published some brilliant colour photos by Photo Frank. From the minute the tiny Olympic Airways flight circled the island to land, Paros spoke to me, and kept on saying all the right things. On my first venture into town, an elderly man gave me a rose. Someone else tried to offload a kitten (cats run amok on Paros because the Greeks don’t spay and neuter; some people own about 20). The clothing boutique owner couldn’t bear to see me in flip-flops – 26 C being winter for a Greek – so she gave me a free pair of brand-new imported Italian shoes. When I protested that I couldn’t possibly accept her offer, she charged me a token two euros. Then, ironically, I did catch a cold, and the local café owner fed me a bottomless cup of hot souma with honey, and someone else bought me socks. As a tourist, I was hardly a rarity. But Parians take an interest in you. Of the Northern Europeans I met in the month I was there, it was easy to see why they had been coming back for 20-plus years. You can see it is easy to love Paros.